The 26.6 metre motor yacht Leila Lina is sold with David Legrand at Fraser Yachts representing the seller and Grupo La Fortune acting for the buyer. 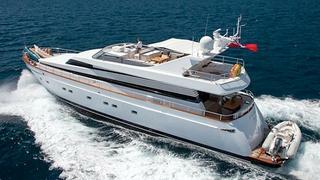 Leila Lina was built by Cantieri di Pisa to an in house design as an Akhir 26S model and launched in 2006. RINA classed and MCA compliant, she accommodates up to nine guests in four cabins consisting of a full beam master suite, large VIP suite, a double and a twin cabin with a Pullman berth, all with en suite facilities. With dark, rich woods, earthy colours, high quality teak, carpets and leather features throughout, her interior is a soothing haven. She has exceptional deck spaces and plenty of functional areas for relaxing and entertaining. Al fresco dining can be enjoyed on her main aft deck with additional seating and sunning areas available on her spacious flybridge. Twin MTU 16V 2000 M91 engines give her a cruising speed of 20 knots. A rarity in a yacht of this size, she features zero-speed stabilisers. Lying in Imperia, Italy, Leila Lina was asking €1.8 million.